Citizens of Mayhem rejoice! Mayhem Police Department is here to save the day! Mayhem is as tough as a city gets and it's only thanks to the dedicated men and women of the Mayhem Police Department that it doesn't simply implode! From petty street punks to maniacal supervillans and even zombies, if you do the crime in Mayhem, you better believe you're gonna do the time! Whether it's patrolling the streets on bikes, surveying in the chopper or bringing down the hammer with the SWAT team, MPD has the tools to get the job done! 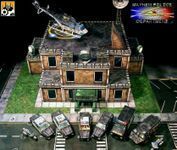 Utilizing the highly successful "footprint" basing system, Mayhem Police Department brings you everything you need to create anything for a small county sheriff's office to a complete cell block and everything in between, even ordinary office buildings! Jam-packed with props and add-ons, almost any modern theme can be expressed and all provided in gridless, 1" and 1.5" format! MPD also features a fleet of police hardware from ubiquitous cruisers to armoured SWAT vehicles, even a helicopter! What are you waiting for??? Your city of Mayhem needs protection, units need backing up and criminals need to be put in their place!